Our Mission — Tuatara Capital, L.P.
A nocturnal, burrowing lizard-like reptile with a crest of soft spines along its back, confined to some small islands off New Zealand. We seek to build a portfolio of businesses that is diversified yet tied together with exceptional people, of the highest integrity, who have a strong desire to be trailblazing innovators. Tuatara’s portfolio companies are market leaders that can adeptly navigate rapidly evolving regulatory and commercial frameworks, as well as strong operators whose practices help to instill excellence in the industry. Driven by consumer demand, medical potential, and pharmacological efficacy, the cannabis industry is gaining stride as one of the fastest growing industries in history. Legislative change has achieved critical mass globally with medical programs approved in 33 U.S. states, social consumption legalized in 10 U.S. states and federally in Canada, and more than 32 countries with approved medical cannabis programs. Globally Emerging Industry. There is momentum in the social and political acceptance of cannabis globally with more than 32 countries having implemented some form of cannabis legislation. Untapped Research & Development Opportunities. We anticipate that mapping the pharmacological efficacy of cannabinoids, the base elements of the cannabis plant, will continue to open new frontiers for medical research and pharmaceutical drug development with broad applications in the health & wellness end-markets. Reflective of the team’ backgrounds in leading, blue-chip investment firms, Tuatara Capital employs a disciplined investment strategy based on fundamental business analyses with a methodical approach to sourcing, monitoring, and executing investments. We take on an active role in working together with each portfolio company through board representation, providing oversight and resources to deliver long-term value to all stakeholders. 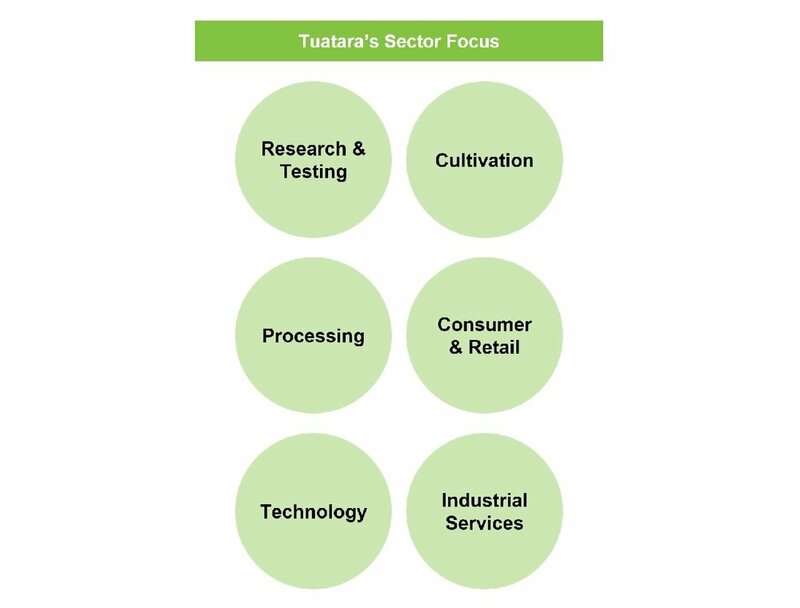 Tuatara’s current investment focus includes the following sub-sectors within the cannabis industry. Tuatara invests in companies with strong financial profiles and sound business models that are well-positioned to benefit from the long-term growth trends within the rapidly evolving cannabis sector.